When the Thirteen bus pulls up one dreary, stormy evening, something about it doesn’t seem quite right. The driver grins down with a mouthful of long, white teeth, and there’s barely any room to sit, but Michael McMichael is bringing his gran something very dear, so he gets on board despite his misgivings. But as they travel on and the rest of the passengers get off, Michael realizes there’s nothing normal about this bus — and the driver is getting creepier by the minute. Best-selling author Bonny Becker’s cleverly rhyming text will chill and thrill readers alongside Mark Fearing’s wonderfully funny illustrations, making “The Frightful Ride of Michael McMichaels” perfect for Halloween story times — and lovers of things that go bump in the night. “The Frightful Ride of Michael McMichael” wins a Parents’ Choice Award! To find out more about how this frightful ride came together, read Bonny’s blog post here. A starred review for Mouse and Bear! “A Christmas for Bear,” the latest Mouse and Bear adventure, has been getting great reviews, including a starred review from Kirkus. For once, I wanted Bear to be the one putting on a celebration; only it doesn’t quite turn out the way Mouse envisions. One frosty night, Bear hears a tap, tap, tapping on his front door. “Merry Christmas!” cries Mouse. Mouse is there for a Christmas party, and Bear has never had one before, but he’s certain that pickles (preferably from France) must be an essential component, along with the reading of a long and difficult poem. Will there be even a tiny present involved? “Hogwash!” scolds Bear. But does Bear really mean it? Curmudgeonly Bear and a hopeful Mouse return in a warm, funny tale full of holiday cheer and true friendship. 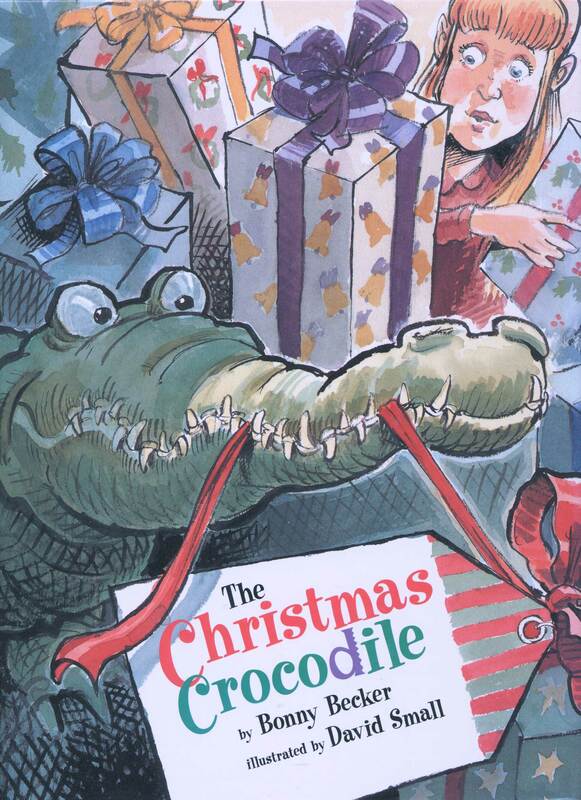 I’m thrilled that my book “The Christmas Crocodile” has been reissued. Many parents have told me it’s become a holiday tradition to read this book to their children. It is illustrated by David Small, winner of the Caldecott Honor. I’m happy it’s also one of Nancy Pearl’s rediscovered books. Pearl, a former librarian, is an influential book commentator and personality on several radio shows. She’s widely known as an authority on literature and people flock to her book suggestions. She has luckily included Christmas Crocodile on her list of favorite out-of-print books to share with her readers. Christmas Crocodile is a fun book that I think every family can relate to in some way – even if they don’t get a crocodile for Christmas! When Alice Jayne finds a crocodile under the tree on Christmas Eve, her family goes into an uproar! The Christmas Crocodile doesn’t mean to be bad, not really, but soon he is eating up Christmas—from the dinner roast to the left stove-top burner…even the Christmas tree! Everyone has an opinion about what to do with him. Uncle Theodore suggests they send him to Africa, Father recommends the zoo, and Aunt Figgy mentions an orphanage. But Alice Jayne thinks the Christmas Crocodile deserves a real family. Can she find him a new home? And will she and the family survive till Christmas morning, with that naughty crocodile gobbling up everything in sight? Sitting there, among the clouds, looking down and day dreaming is… a little cloudlet. Gale would like nothing more than to make one real cloud shape. But instead, she creates something different. Wait until all of Cloud Country finds out! 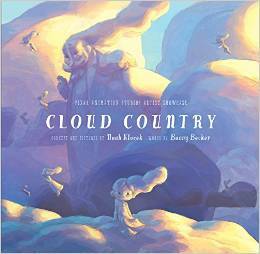 “Cloud Country” will be released September 2015. It’s a collaboration with Pixar artist Noah Klocek. This entry was tagged news. Bookmark the permalink.